Let us just say that Bushnell has come a long way over the past 20 years. In fact, just 15 years ago no one would consider using a Bushnell scope on a tactical rifle, but then they incorporated Bausch & Lomb into their business. They eventually removed the B&L name but kept their B&L 3000 and 4000 line of good quality scopes as the Bushnell Elite 3000 & 4000 line of scopes. Through the years Bushnell updated those scope lines and they became the 3200 and 4200 series. 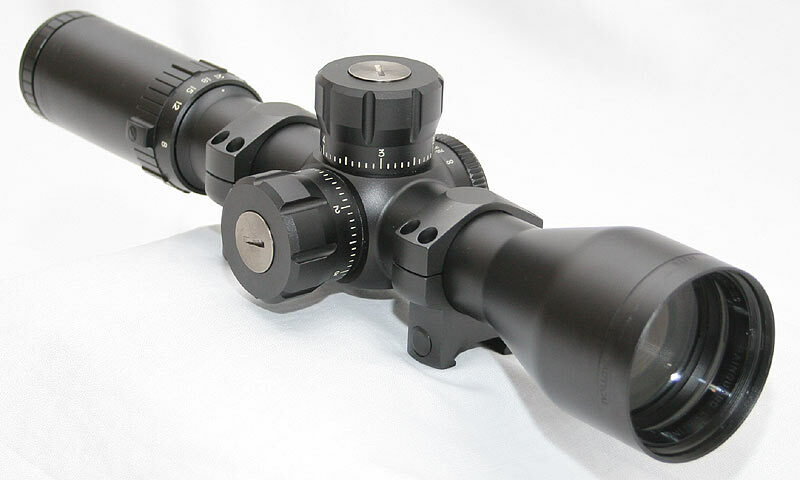 Recently they added an even higher quality line of scopes called the elite 6500 series. Through those iterations of scopes lines they have had various Tactical scopes in the mix, several of which we have reviewed on this site. Today (2012) they have a dedicated line of scopes, known as the Elite Tactical that is geared directly for the Tactical market. The Elite Tactical line of scopes spans the entire spectrum from $300 scopes to the new $2000+ DMR scope, which is what we are reviewing here. The DMR 3.5-21x50mm scope is the top of the line Bushnell Scope and has a suggested retail price of over $2000. The street prices are less than that, but still, a Bushnell scope that sells for over $1000 may raise a few eyebrows, it did for us. So we figured we might as well take a look at one while we could and see how it stacks up against the competitors. The scope comes packaged with all the normal items found with modern scopes including some manuals and a warranty card as well as a 4″ sunshade, which is always nice to have included. There are also some bikini style scope caps as well. When you pull the scope out you notice the weight of the scope, which is somewhat to be expected with the 34mm tube, though the scope is not too large. There is the standard anodized matte black finish that is typical on all tactical scopes these days, and it matches about the same as all the rest of the Bushnell Tactical scopes. The finish is even and nicely applied. The tube, as mentioned, is the larger 34mm diameter which has become popular on some of the higher end tactical scopes as of late. The extra diameter does allow for extra strength and provides more adjustment room on the internals so that a greater number of vertical, and horizontal, adjustments can be incorporated into the scope. The down side is the physical size and weight of the scope. There are not as many 34mm rings either, but all of the high end ring makers are onboard now, so that is not too much of a concern. All of the normal branding markings on the DMR scope are all subdued black with the only easily visible markings being the knobs and the power ring and they are all marked in an off white color. The overall look it very tactical in nature. The bell on the scope is a bit shorter than what is typically popular today, but it does cut down on some of the size of the scope which equates to less material which helps with the weight of the scope. Technically there is no reason why a large and long bell is required. The shorter bell can also allow for a good amount of mounting area on the tube for the rings while keeping the overall length reasonable. The overall shape of the scope looks good enough, if not just a bit short and compact. The eyepiece is a fast focus eyepiece, which is also rapidly becoming the standard on most tactical scopes. The entire diopter range can be covered in about 1.6 rotations of the eyepiece. I had no problem getting a crisp reticle with my corrective glasses on and I was even able to focus the eyepiece without my glasses on. This is with my not so great eyesight, which is unfortunately getting worse with age. This allows for a good amount of diopter range and will work for most shooters with or without glasses being worn. The eyepiece has a rubber protective ring on it to help in case the scope has a violent run in with your head, affectionately known as a ‘scope kiss’. The eyepiece has a good amount of resistance when adjusting it and it is smooth through the entire range. As with all of the fast focus style eye pieces, there is no locking ring, though the resistance force should be enough to hold it in place once adjusted. In front of the long ocular housing is the magnification selection ring which is marked from 3.5x through 21x which covers about 180 degrees of the circumference of the scope tube. The power ring itself has serrations as well as one large protrusion combined with other small protrusions around the ring, all in an effort to help with gripping the power ring when adjusting it. It all helps and getting a good grip seems to be no problem, even with gloves on. One thing I do not like is that the actual numbers for the power markings are in front of the serrations and protrusions and are slightly tilted down away from the shooter, there is no way to easily see what power the scope is set on while you are behind the scope. Also, the indicator mark is invisible until looking almost straight down on the scope, but it is positioned right on top so you can guess what power you are on without seeing the dot. The other saving grace is that the scope is Front Focal Plane (FFP) meaning it does not matter what zoom power you are set on since the reticle grows and shrinks with the power setting of the scope and it will always be accurate for your MIL readings when estimating range. The larger 34mm tube allows for a wider shoulder area where the elevation and windage knobs are located and like the other 34mm tube scopes that are out on the market, Bushnell has taken full advantage of that extra real estate by creating very large knobs. The knobs are an external style knob that are a large diameter, but are really not too tall. The lower profile on these knobs is really not that low when compared to other external knobs on a traditional 1″ or 30mm tube scopes, but they just look lower profile because of the wide diameter. The top of the knob has deep groves about every half inch around the perimeter of the knob to help with grip and the top portion actually tapers outward. 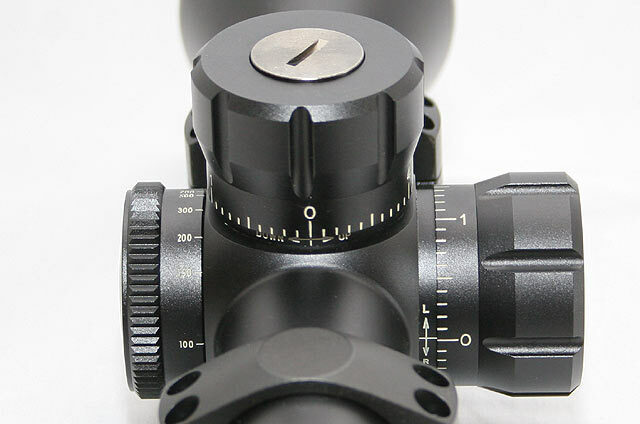 The function of the knob is nearly identical to the knobs on the Weaver Tactical scope we reviewed a few months back. This means that while the knob is pressed down, it is locked and will not move. To be able to dial in adjustments to the knob you have to pull the knob up to unlock it. The knob raises a bit more than a quarter inch, which is more than the weaver did and is actually feels like a long amount of travel, we do prefer less. Once the knob is lifted up and is ready to adjust, the clicks themselves are firm and with very little slop. The clicks have a very positive tactile feel that is muted audibly but gives no doubt when a click is made and how many clicks you have gone. Beyond the long pull up to get the knob ready to adjust, the system works very well. Each click is .1 MIL, or for the metric users out there, it is 1 centimeter at 100 meters. There are 5 MILS of adjustment per revolution and the sample scope we have here had more than six revolutions of adjustment, 34 MILS total. This is a lot of vertical adjustment and allows for some extreme range shooting when the rifle is setup correctly. The 5 MILS of adjustment per revolution allows for a 308 Winchester to go from 100 to 600 yards in a single revolution and out past 900 yards in only two revolutions of the elevation knob. The knobs connect to the internal post via the geared method which means that if the markings are off during production, when you mount the knob onto the post the indicator marks will not line up. On this sample they were perfectly aligned, a good sign of quality. The screw on top that holds the knob onto the post has a “coin notch”, curved to fit a quarter. Frankly, we hate this type of setup. The rest of the Elite Tactical series of scopes has an Allen wrench hole on top and a provided Allen wrench and this is a much preferred method than the coin notch. We hope Bushnell changes this down the road. The windage knob is the same as the elevation knob in size, shape, and in the way it functions. The markings are well marked throughout the scope with an off white color and the numbers are a good size and easy to read. On both the elevation and windage knob there are horizontal marks on the post so that the operator can track how many revolutions have been traveled. The windage knob counts up only in the right hand direction. 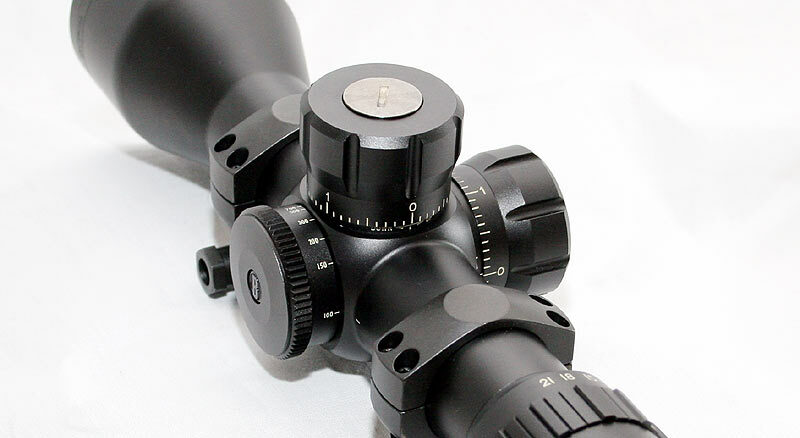 There are clear markings on both knobs as to which direction is up or down, left or right, and the operator does not need to move their head away from the scope to see those indicator markings. On the left hand side of the scope is the focus knob which is the same diameter as the elevation and windage knob but is not nearly as tall. There are numbered marks for various ranges from 50 yd out to 700 yards and then the last setting is set to infinity. There is an aggressive serration on the top of the knob to help with gripping it and the knob operates reasonably smooth through the entire range and provided no problems with focusing the scope at all the ranges we tested it at. There is no illuminated reticle so there are no other controls on the scope. At this point in time it was time to test the scope at the range and see how things played out operationally. For our operational tests, we mounted the scope onto one of our entry level rifle packages which was a Remington model 700 chambered in 308 Winchester. The rifle had an EGW 20 MOA canted base and we used Leupold Mark 4 steel 34mm rings. The scope mounted without any problems and there was plenty of mounting area on the tube which allowed us to easily get the proper mounting location for eye relief. This particular rifle shoots sub .5 MOA with HSM 168gr Match grade ammo which is what we were using for all of the shooting tests with this scope. The sky was sunny and about 30 degrees during our shooting evaluation. The DMR 3.5-21x scope is available from Bushnell with the traditional mildot and their 2nd generation DMR reticle, also known as the G2DRM. This scope is also available in more limited numbers with the Horus H58 reticle if that is a reticle you might be looking for. 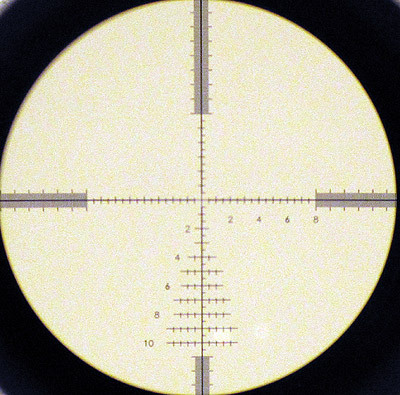 The scope we tested had the G2DMR reticle which is essentially a hash style reticle setup in MIL units. There are a number of features with the reticle that are worth pointing out such as the thick stadia that is essentially a series of hashes separated by .1 MIL, which allows for precise measuring. There are also longer hash marks on that thick part that mark each full 1 MIL. The inner stadia is broken down with hashes on the even mil marks as well as half MILs. The inner horizontal stadia have 8 MILS between the cross hair intersection and the thicker stadia. On the right hand side of the horizontal stadia, every even MIL hash actually has a number beneath it. On the vertical stadia above the crosshairs there are 6 MILS before the thick stadia begins, but below the horizontal there are 11 MILS and each even numbered hash has a number next to it. Also, on the bottom portion of that vertical stadia there are separate horizontal stadia that grow wider the further down you go. On those horizontal stadia there are smaller hashes that represent half MIL marks. These are used for aiding with moving target and wind hold offs. It takes a lot of writing to describe the actual reticle and all of that translates into a busy scope picture. Yes, all of those marks are helpful for ranging, holding off and compensating for moving targets, but it can get busy and can cover some details in your scope picture. These are some of the same things that need to be overcome with the popular Horus reticles as well. Yes, they do work, but they have their draw backs as well. Luckily with the DMR you have a few options and can even opt for the clean and simple traditional mildot reticle, though you give up some of the other features that help you as a shooter. The reticles are FFP and the balance of reticle thickness through the large zoom range is well done and the reticle is useful at all zoom ranges, though when the scope is set all the way up to 21x, lots of the details in the lower portion of the reticle are no longer visible. 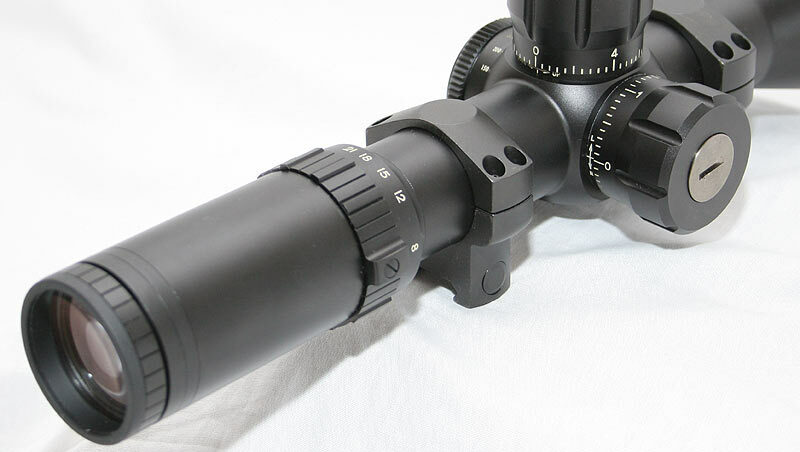 Optically the scope is high quality with good clarity and definition from edge to edge. Light gathering seems to be good and we do not have any complaints with the glass quality. I do not know that I would rate the glass in the same category as Zeiss or Schmidt & Bender, but it compares favorably with other $1000 scopes. The full 6x of zoom power going from 3.5-21x does provide an exceptionally broad range of flexibility and allows the scope to be used on a wide range of rifles. For shooting, we zeroed the rifle at 100 yards and shot a smaller 2 MIL box which showed good repeatability of clicks when the scope ended with the fifth group right on top of the first and with nice groups as each corner of the square. To test the accuracy of the clicks we adjusted the scope 6 MILS left and fired a group and then came back to zero and fired another group to again test repeatability. The groups measured 22.0″ apart which is 6.11 MIL, or 1.8% of error. This is good, but not as good as some of the other scopes we have tested. There certainly is some measurement error due to group sizes, but we do like to see sub 1% of error, though anything less than about 3% should be okay. So how does the Bushnell DMR scope stack up against other competitors in the $1200-$1500 range? Well, it compares okay but in our opinion not great. The quality appears to be good with a solid feel and appearance of quality. Good solid clicks go a long way to instilling confidence in construction quality and the glass itself is the best that Bushnell offers on any of their scopes. The 34mm tube is nice, but in reality it is not necessary as the same can be done with smaller tubes. The larger knobs are easy to operate and the functionality is good, but overall I just do not know that I could say I would recommend one over a Nightforce or Leupold for the same, or similar, price. The DMR does have the large 6x of zoom range and if that is a higher priority on your requirement list than the DMR would be worth looking at. The high amount of vertical adjustments is also a positive for the scope that will rate it higher for those shooting extreme ranges. Overall the scope is not bad, certainly the nicest scope Bushnell offers and it would work well on most any tactical rifle. With a few little tweaks it could be even better and if the price dropped to about $1000 it would be a very good buy, but for now, it is just a decent buy. these do retail for about 1200 now… maybe a little less with some shopping. Did a side by side for low light with NF Beast and Vortex HD2 and my ET6245FG was much brighter and clearer. Don’t care if Bushy don’t get the recognition the deserve. Love mine! Even with the side-knob, parallax is a huge issue for me using this scope at 21x at 100 yards. I have to dial back to 15x. The groups at 21x are 1.125″ and sporadic, the groups at 15x are 0.7″ and consistent. It was impossible to get a consistent cheek weld at close range. Is the side knob really just a “focus knob” ? Will this issue go away somewhere between 100 and 1000yds? I’d prefer to be able to use 21x, instead of avoiding it. It is a parallax adjustment, but with those higher magnifications it can be an issue at closer ranges as when the user is “focusing” the knob, a decently wide range will look clear and sharp, but yet the parallax itself may not be right on, which will cause the problem you see. You mentioned that this scope doesn’t stack up well in the $1000-1500 range. So what does the reviewer recommend for a .308 in the under $2500 scope category? Its not that the scope is not good, it actually is very good (scored 4 out of 5) and the glass has performed very well over the past few years. But in that same price range you have Nightforce, Vortex, some IORs, and some others that are good competition. The all have their pluses and minus and they should all be looked at to see which fit your criteria best. For $2500, you also can step up to some S&B scopes, Premier Reticle, Steiner and the high end Trijicon, which are all fantastic scopes as well. Hmm.. I have the scope and love it. Not sure where you buy your NF from but if you can show me where to buy a First a Focal NF or any other scope that can compete with this one for sub-$1200 that would be great. The PST FF can’t even come close to competing with glass quality or repeatability. Leupold and NF FF scopes run $2000+…. When this review was written the NF NXS F1 scopes were still available and comparable in price (with the DMR and HDRM scopes running $1200-$1600 depending on which one you get and the NXS F1’s a bit more but in the same ball park). Now the NXS F1s have been replaced by the ATACR F1s and you are correct, priced much higher. The PST scopes are indeed a step down from these. These DMRs are a very good scope. How do the dmr’s stack up to the burris xtr 2’s? Anyone have 1st hand experience? I had the opportunity to test my Bushnell XRS 4,5-30 x 50 in Butte, MT (Sept. Course) with a 308 Rem. Sniper Central and the performance was outstanding. I would deduct that your analysis and recommendations for the 3.5 x 21 could be applied to the 4.5 -30. Excellent scope, clear, sharp, reliable and better price than Leupold, Nightforce of similar specifications. Sorry, August basic & advanced Course! I bought the Bushnell DMR a couple of months ago. Replaced my Hensoldt- 4-16 x 56 with it with it and never had any regrets for that . Okay, the glass is not quit as good as the Henny, but the recticle is much better on the Bushnell. My 5 shots groups on 100 meters are better with the Bushnell as with the Hensoldt wich is 3 times the prize of the Bushnell. So i am very happy with my Bushnell, and for that prize its a very good bargain.